As town liaison between the business community and the local government of Enfield, Connecticut, Courtney Hendricson knows how important strong communication can be. With a full schedule of local events, and a number of different audiences to speak to — including local business owners, local residents, media contacts, and elected officials — Courtney knew she needed a better way to manage her office’s communications. In October 2013, Courtney found out about Constant Contact. Having used email to communicate with the business community in the past, Courtney was excited to have a tool that would allow her to manage all of her email and event communication from one central dashboard. With Constant Contact, Courtney is able to create custom web pages for each of her events. Each page includes important event details and also has the option to register in advance. Courtney can also create a series of email communications around the event — including invitations, reminders, and follow up emails. By improving her strategy, Courtney has recently learned some valuable best practices to make her communication effective than ever before. 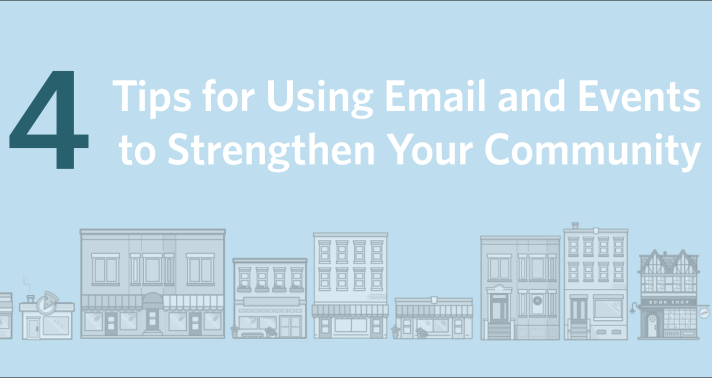 With over 2,000 contacts, it’s important that Courtney keeps her different contacts organized so that she is sending emails out only to relevant audiences. For example, while she may only want to send a press release out only to her media contacts, an invitation to an upcoming networking event would be more appropriate for her business owner community. “I do the best I can to put all my contacts in separate lists so I can email just the development community, or just businesses, or elected officials, depending on what kind of event announcement or email I’m sending,” she says. In total, Courtney has used Constant Contact’s contact management system to divide contacts into eight different contact lists. Courtney knows that engaging her audience means more than sending relevant information. To encourage as many people as possible to read and act on her messages, she thinks about each message from her contacts’ perspective. After creating an email or an event page, Courtney often extends the reach of her message even further by sharing a link with her social media audiences. Using Constant Contact’s Simple Share, Courtney can easily share her campaign with her social media audience on various networks like LinkedIn, Facebook, and Twitter. “I use Simple Share to share my message with my connections on LinkedIn. Then, I rely on my social media team to share on Twitter and Facebook,” Courtney explains. Still, to make sure she was sending the best messages possible, and to get helpful advice along the way, Courtney took advantage of Constant Contact’s training and support. “I took a couple classes when I first started out, and they gave me great advice I never would have known. I also called the support line a lot in the beginning. They were really helpful and receptive to my questions. Somehow they always understand what I’m asking!” she says. Now, Courtney has confidence each time she creates a new message. By finding the right tool, Courtney is able to save time by managing her outreach from a single login. Want to see how Constant Contact can work for your business? Start your free 60-day trial today. Already a customer? Log in and create something new!